Biochemistry majors Kaitlyn McCue (left), a senior, and Christina Li, a junior, work in a Shineman Center biochemistry lab. At the annual Quest symposium on April 4, the two will present their research on a correlation of mosquito-borne diseases -- dengue, chikungunya and zika -- and patient markers for stress preceding illness. 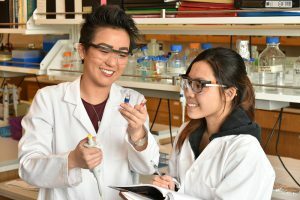 OSWEGO — SUNY Oswego biochemistry majors Kaitlyn McCue and Christina Li will present at the college’s annual Quest symposium Wednesday, April 4, their research on a correlation of mosquito-borne diseases — dengue, chikungunya and zika — and patient markers for stress preceding illness. Biochemistry majors Kaitlyn McCue (left), a senior, and Christina Li, a junior, work in a Shineman Center biochemistry lab. At the annual Quest symposium on April 4, the two will present their research on a correlation of mosquito-borne diseases — dengue, chikungunya and zika — and patient markers for stress preceding illness. McCue, a senior and resident of Hopewell Junction, and Li, a junior from Brooklyn, sought to determine whether hair cortisol levels in patients with dengue, chikungunya and zika in Machala, Ecuador, show a correlation with stressors such as an earthquake in April 2016 that killed more than 650 people in the South American country, with months of aftershocks. A major epidemic of zika came on in the quake’s wake. “Machala was chosen because it was previously determined to be a hotspot for these three diseases,” McCue said. McCue and Li expect significantly different cortisol levels for those under more stress and with more severe forms of the disease in mosquito-prone tropical regions, such as Ecuador. The devastating earthquake in Ecuador may have made people’s immune systems more vulnerable to the diseases, they theorize. The pair’s research advisor, Dr. Kestutis Bendinskas of SUNY Oswego’s chemistry faculty, worked on this study for half a year before passing it on to his students, who “did all the bench work for the project,” he said. McCue made a successful grant proposal to the college’s Scholarly and Creative Activity Committee, funding her and Li’s research and enabling them to complete the study. The researchers hope to bring their study, titled “Hair cortisol concentration in patients with tropical mosquito-borne diseases in Machala, Ecuador,” to the public. “Hopefully we will publish a paper on our research. If this paper is published, then it will be available to anyone,” McCue said. 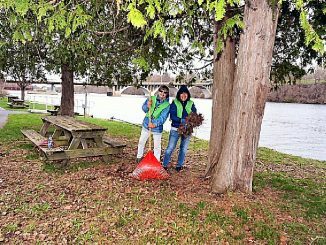 Li hopes to continue doing research that has a significant impact, such as this study, as an undergraduate in Oswego and later in graduate school. Bendinskas said both Li and McCue worked long hours for many days in a row to perfect the experiments. “The quality of their work is that of the most rigorous national standards. Students’ effort during academic breaks inspires me in the excellent future of science in the U.S.,” he said. McCue has just been accepted to a doctoral program and Li has been selected for a summer research program prior to her senior year at SUNY Oswego. “I cannot be more proud of these two young ladies,” Bendinskas said. The researchers are awaiting significant results and complementary data from Syracuse University. Centered in Marano Campus Center, the Quest symposium will take place from 9 a.m. to 5 p.m. Wednesday, April 4, in various campus venues. For more information, including an upcoming schedule, visit oswego.edu/quest. The event is free and open to the public, there are no classes April 4 and parking on campus is free that day.